It’s a proven scientific fact that puppies are ADORBS, but we all have a responsibility when it comes to pet ownership. Dog neutering is an important part of being a responsible pet parent because it controls pet overpopulation. Plus, the procedure provides your pup with plenty of health and behavioral benefits. But how much does it cost to neuter a dog? And when is the best time for your pup to undergo the big snip? Don’t worry — we’ve got you covered. Here’s everything you need to know about dog neutering! If you adopt your pup, most animal shelters and humane societies will include neutering costs in the adoption fee. Low-cost neutering services are easy to find! Ask your vet, or use this handy search tool from the ASPCA. In some areas, certain breeds automatically receive free or discounted neutering services in order to control overpopulation (the San Diego Humane Society offers a complimentary neutering program for Pit Bulls and Chihuahuas). Ask at your local humane society. Your local vet may offer discounted dog neutering at certain times of the year, or they may provide extra perks, like microchipping your dog during the procedure. There are tons of ways to make neutering a dog totally affordable. But what happens to your pup during the procedure? For female animals, the procedure is called “spaying” a dog. A spayed dog does not have her reproductive organs, and isn’t able to carry any puppies. The phrases “fix,” “alter,” and “sterilize” apply to both genders. Dog neutering is possible any time after eight weeks of age, but some vets recommend waiting six months until your pup hits puberty. Ask your vet about what’s best for Fido! Neutering is super simple: your vet will place your dog under general anesthesia, and then make a small incision in front of the scrotum. Once the testicles are removed, the stalks of the testicles are cut. The procedure sometimes requires stitches. Typically, your dog will be able to come home on the same day of the procedure. 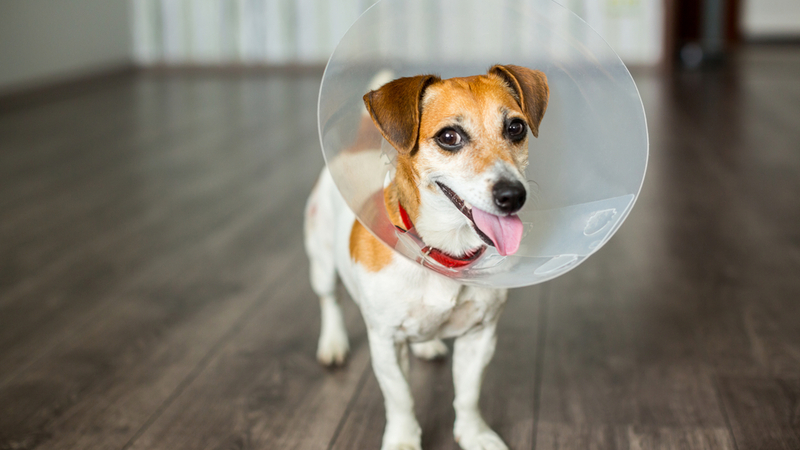 Your pup may need to wear the cone of shame for a while after surgery. But after 14 days, the incision will be completely healed! We know, 14 days sounds like a long time — but that’s about how long it takes for people to heal, too! While your dog heals, you may notice that he doesn’t want to eat for the first day or two after the procedure. That’s fine — he’s still recovering from the anesthetic, and he might be a little freaked out about what just happened to his nether regions! No bathing! It could introduce bacteria into the surgery site. Check the incision twice a day. It may be swollen, bruised, and red. 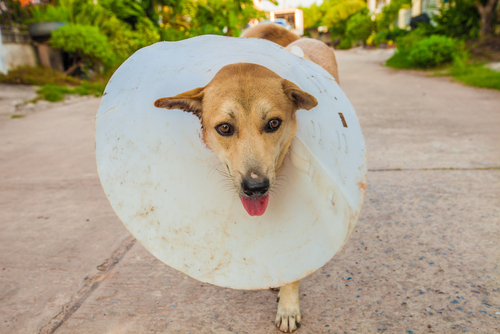 Watch out for any abnormalities — and if your pup licks the incision, pop on that cone of shame. Keep Fido restricted! This is tough if you have a puppy, but it’s vital that your dog does not run, jump, play roughly, or walk off leash in order to allow the incision to fully heal. Don’t let your dog roam unattended. If you can’t keep an eye on your pup all the time, keep him crated or in a small room for short periods while you’re away. Make sure he wears a collar when he’s on his own. It might seem mean or inhumane to remove your dog’s dude-bits, but it’s an essential part of responsible pet ownership. The ASPCA explains why this is good for both your pup and the overall pet population. Every year, millions of dogs are euthanized because there are more pets than families that are able to care for them. Dog neutering helps your pup’s health by preventing testicular cancer and certain prostate problems — but it also prevents your dog from roaming off to find a mate, which contributes to pet overpopulation. Neutering reduces your dog’s testosterone levels, which may reduce aggressive behaviors like mounting other dogs, people, and objects. Your neutered dog is also less likely to mark his territory within the home. Are you considering dog neutering for your pup? 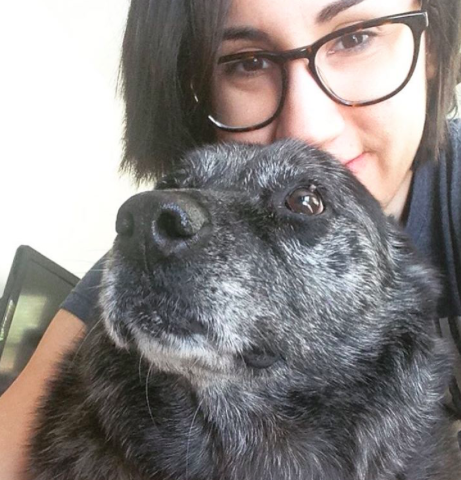 It may require a visit to the V-E-T, but it’s worth it! Tell us about your dog in the comments below! Can Dogs Eat Watermelon? Or Are They Doomed To Never Taste This Picnic Treat? Can Dogs Eat Fruit? Find Out With This Infographic!